Saying good-bye to a favorite teacher is a hard thing to do. Especially, is she is not coming back to the school at all next year. 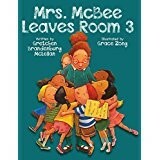 Each child has a special job in this story of packing up the classroom on the last day. While most of them see each other being busy, they are not able to see William drawing his pictures until almost the end of the story. But he becomes a hero when they realize his pictures help them remember all the great times they had during the year. Teachers and librarians can use this book as they prepare for the end of the school year and especially, when a teacher is retiring or just moving on to another career. The illustrations are great fun and very realistic in showing children at work with tongues sticking out and smiles on their faces. This will become a favorite.